Engenia® Herbicide is an integral part of the dicamba-tolerant cropping systems recently launched for soybean and cotton production. With a 50+ year history of dicamba innovation by BASF, this herbicide provides a powerful solution to control glyphosate-resistant and tough-to control broadleaf weeds including: marestail, palmer amaranth, waterhemp and ivy leaf morning glory. Engenia herbicide is specially formulated to maximize surface deposition and minimize vapor drift, however maximum drift control is still key for the successful application of this product. That is why BASF recommends using the Turbo TeeJet® Induction (TTI™) spray tip for Engenia application. 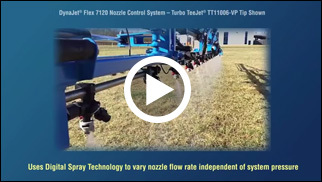 The TTI is a proven, reliable spray tip developed specifically with drift reduction in mind. It produces Ultra Coarse (UC) and Extremely Coarse (XC) droplets, for the ultimate drift control. Additionally, this spray tip generates less than 2% driftable fines* – one of the very lowest driftable fines percentages of all spray tips available today. If you plan to apply Engenia herbicide, using TeeJet TTI tips on your sprayer will ensure optimal performance and weed control. Please contact your local Authorized TeeJet distributor today and get a set of TTI spray tips on order for the spring. Visit http://agro.basf.us/campaigns/engenia/ to learn more.